If you’re anything like us, bananas can take three paths in your house: 1) they get enjoyed when perfectly ripe, either alone or sliced in cereal; 2) they’re tossed in the garbage because they have been terribly neglected; or 3) they’re part of a steadily growing stockpile of overripe bananas in your freezer, each wrapped in plastic, just waiting to be put to work. Sound familiar? Rescue those overripe bananas from the trashcan or an eternity in your icebox. 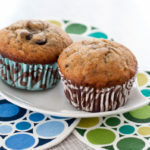 Here’s the ultimate banana chocolate chip bread recipe from our Twitter pal, @DC2ALB, who blogs at http://ieatdc.blogspot.com/. The recipe makes about a dozen muffins, one large loaf or a few small loaves. Preheat oven to 350. Cream ½ cup butter with 1 cup of sugar. Beat in 2 eggs and 1 or 2 mashed ripe bananas (or let the stand mixer do the mashing for you). Add 2 cups flour, 1 teaspoon baking soda, ½ teaspoon salt (a dash more if you’re using kosher salt) and mix until incorporated. Stir in 1 teaspoon vanilla extract and 1 very generous cup of chocolate chips. For the large loaf, bake for about 60 minutes (check the loaf to see how it’s doing around the 45-minute mark) or until a toothpick inserted in the center comes out clean. Small loaves take roughly 40 minutes and muffins approximately 22 minutes to bake. Ovens will vary, so check on your banana bread as needed. Cool on wire rack. Devour. Muffin baking tip: If you press on the top of the muffin and it sinks a bit, put the tray back in the oven. If the muffin springs back and feels spongy, they’re ready to come out, and any raw bits will finish cooking out of the oven. You’ll notice that the muffins pictured are housed in some rather fancy baking cups. 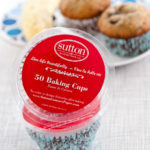 Sent to us by Sutton Gourmet Paper, they aren’t only pretty, but oh-so practical. They’re just as opaque coming out of the oven as they are going in, so the beautiful pattern on the cups doesn’t get lost once you’ve baked with them. And most importantly – the paper peels cleanly away from your muffin, so you actually get to eat the whole muffin, not having lost bits of it to a cheaper baking cup. We’ve used them on several occasions and are always pleased with the results! They cost $4.95 for 50 cups, and we find they are well worth it. Sam likes to make her banana bread with cream cheese. Do you use any unique add-ins in your banana bread? 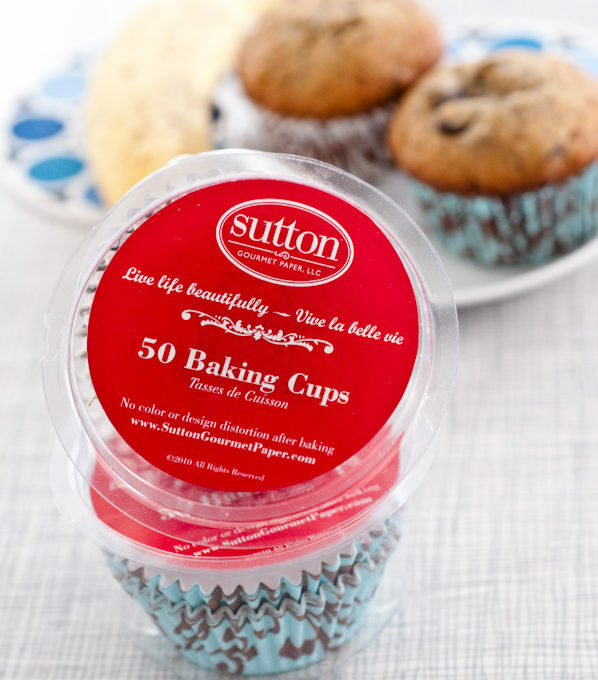 DISCLOSURE: While Sutton Gourmet Paper sent us the baking cups for free, we really *do* think they rock.